Snap Frames stand 8 feet tall to really capture attention in any room. These Pedestal Stands have style and function! BIG, at 8 FEET TALL, they certainly get noticed! 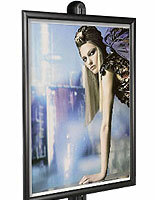 FOUR big 24"w x 36"h graphic frames make this a very versatile advertising device. These pedestal stands, also known as display stands, are great marketing tools for promoting recent events and new products. The display holders are also height adjustable along the entire length of the display pole. These pedestal stands are solid and durable aluminum displays with a wide, stable base. These pedestal stands are double sided displays with more impact, particularly with two sign frames per side, saving floor space while displaying 4 different signs. 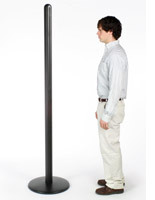 Pedestal stands are commonly used in large, busy areas like malls, convention centers and building lobby areas. These pedestal stands are designed for indoor use only. 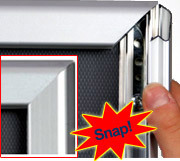 The four frames have snap open features. Simply lift all four frame edges, slide the sign material under the clear plastic lens. and snap the frame sides closed. Clear plastic non-reflective lenses are provided to protect your posters. Attaching the snap frames or adjusting the height is simple using the screws on the connector plates on the back of the poster frames. 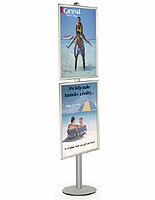 These 8 foot tall pedestal stands make your messages interesting, easily catching public attention.